A SpaceX Falcon 9 rocket explodes Sept. 1 during fueling operation in preparation for a static-fire test. WASHINGTON — Investigators have traced the explosion that destroyed a SpaceX Falcon 9 on the pad Sept. 1 to a "large breach" in the helium system in the rocket's second stage, although the root cause of the accident remains unknown. In a Sept. 23 update, the first released by the company in nearly three weeks, SpaceX said that an accident investigation team continues to study evidence from the explosion that took place while the rocket was being fueled for a static-fire test. Helium is used to maintain the pressure of the liquid oxygen tank. In the June 2015 Falcon 9 failure, a strut holding a helium bottle in place within the upper stage's liquid oxygen tank failed at below its rated strength, causing helium to leak and the tank to overpressurize and break apart. SpaceX, though, said there was no link between that failure and this accident. "Through the fault tree and data review process, we have exonerated any connection with last year's CRS-7 mishap," the company said, referring to the June 2015 launch failure. 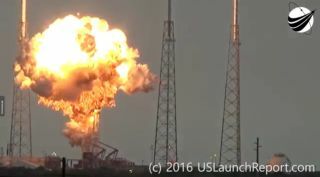 The company said an accident investigation team, which includes SpaceX personnel as well as those from NASA, the U.S. Air Force and the Federal Aviation Administration, continue to examine "all plausible causes" of the accident. The failure took place quickly, SpaceX stated, with a loss of telemetry from the rocket less than a tenth of a second after the first signs of a problem. While the root cause remains unknown, and thus the scope of any corrective actions, SpaceX said it remains confident it can resume Falcon 9 launches as soon as November, resuming assembly of various vehicle components as they're cleared by the investigation. "We will work to resume our manifest as quickly as responsible once the cause of the anomaly has been identified by the Accident Investigation Team," the company stated. "Pending the results of the investigation, we anticipate returning to flight as early as the November timeframe." SpaceX also stated that the investigation is not affecting its work on NASA's commercial crew program, noting that the investigation "will result in an even safer and more reliable vehicle for our customers and partners." A company official made similar comments last week. "I still know what I have in front of me for the next day, the next month," said Abhishek Tripathi, director of certification at SpaceX, during a panel session at the AIAA Space 2016 conference in Long Beach, California, Sept. 16. "It doesn't affect my day-to-day work while they're working on the anomaly." The investigation also does not appear to affect plans by SpaceX Chief Executive Elon Musk to unveil long-awaited details of a human Mars mission architecture at the International Astronautical Congress in Guadalajara, Mexico, Sept. 27. A page on the SpaceX website counts down the days until a webcast of his address, titled "Making Humanity a Multiplanetary Species."